I spent a whirlwind 48 hours in NYC this past weekend, surrounded and spoiled rotten by wonderful people. We ate genuine, card-carrying New York pizza at a friend's house in Brooklyn on Friday, which almost made the trip worth it by itself, that's how good this pizza was. Another friend treated me to a cozy place to stay and a yoga class on Saturday morning. And fall in New York? Heavenly, obviously. Cool, crisp air, changing leaves, boots and scarves and holiday window displays. I love it all and wish I'd had more than two days to relish the season with my amazing friends. A couple of these friends organize a pub crawl every year to raise money for charity. 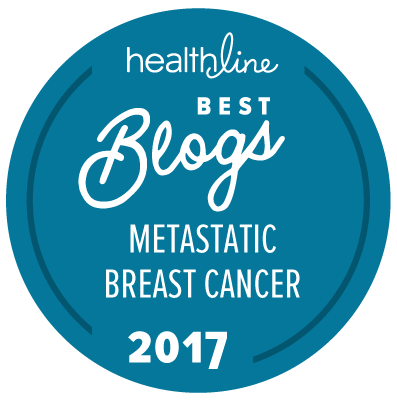 This year, they directed their efforts toward the Susan G. Komen Foundation with an aptly titled "Crawl for the Cure - Hooray for Boobies Edition." I flew out to New York as the unofficial mascot. Thirty or forty of us spent Saturday afternoon pub crawling around the East Village wearing ridiculously perfect hot pink t-shirts designed for the event by another couple of friends. 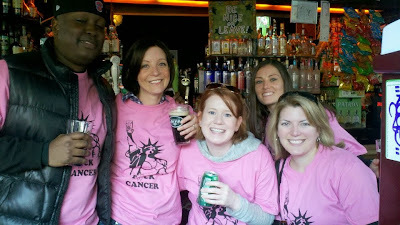 Waitresses and even a bar owner on our crawl were eager to share their own friends' stories of triumph over cancer. I only cried a couple of times. 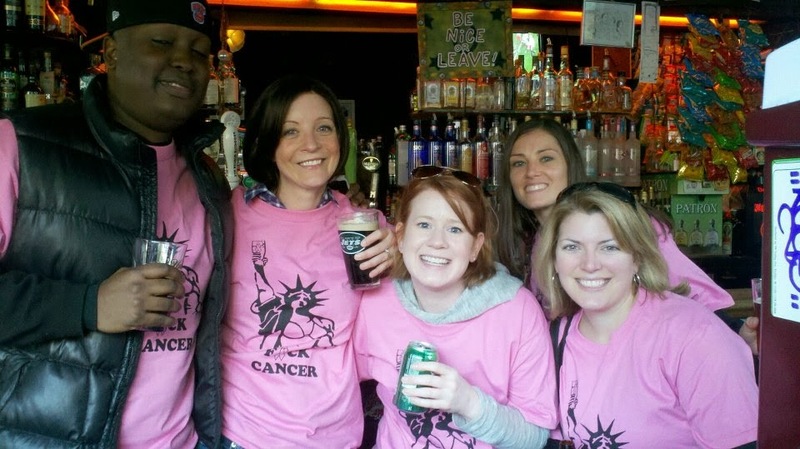 All told, the pub crawl raised nearly $2,500 for breast cancer research. But even more dear to my heart than the money raised was the love I felt from everyone who participated on Saturday, and even those who didn't raise a pint glass (or three) with us but who donated their money, time and energy to the effort. Have I mentioned lately how incredible my friends are? I'm smiling as I read this post. I'm glad you had such a wonderful weekend. Love you.